Here we are sharing the download link of all version fast-boot or edl mode ROM for Xiaomi Redmi Mi 5A (MCI3B). 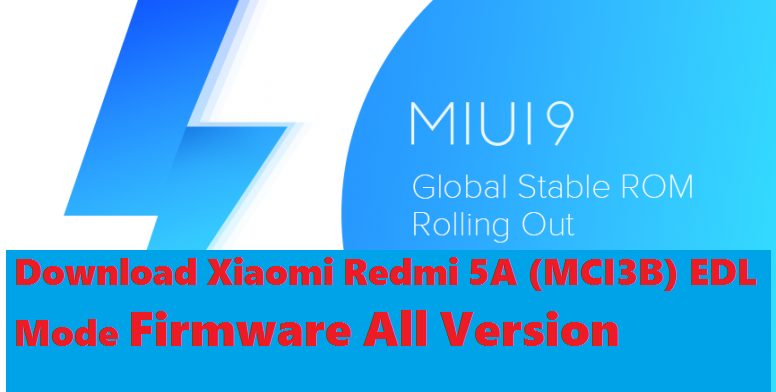 These Mi 5A stock firmware can be used for flashing and unlocking of Redmi 5A Android 7.1 smartphone, after flashing with old version of MIUI ROM on Xiaomi Redmi 5A you can do Mi Account unlock by selecting Flash_All_and_lock on the Mi flash tool. MIUI 9 Global Stable ROM V9 NCKMIEK Released For Redmi 5A. Download Now all version of MIUI Redmi 5A NCKMIEK ROM and flash your Xiaomi Redmi Mi 5A phone using Redmi flash tool. What's New in MIUI 9 Redmi 5A ROM? New Mi Mover, supports data migration restarting. During migrating data to the new phone, device hotspot connection will be restored automatically in case of interruption to complete the data migration. Optimization - Hide free and incompatible themes in the list of the purchased items. Optimization - "Add to favorites" icon adjustments. New Distance sensor dynamic calibration function, to ensure that black screen appears correctly. Fix Apps stopped working in the background. New App lock supports hiding messages from selected apps. Optimization - Vibration no longer affects the features which reduce ringer volume when the phone is lifted or flipped to silence. Fix Messages with one-time passwords disappeared. Optimization for Adjusted time for tapping the Lock screen notifications. Optimization for Multiple themes supported on the clock widget. Optimization for Move app icons into a folder easier. Optimization to Adding widgets to an empty spot with a single tap. Optimization for Updated Peach blossom and Asphalt themes. Optimization to Hide free and incompatible themes in the list of the purchased items. Optimization for "Add to favorites" icon adjustments. Fixed Previews in recent wallpapers rotated. Fixed Gallery Image has been compressed multiple times. Fixed Mi Mover can't continue to migrate data after the network connection is interrupted and restored. Fixed Mi Mover can't migrate all apps to the new phone. Optimization for Introducing Button and gesture shortcuts. Optimization to Reduced the number of push notifications when the user is signed out. Optimization to Received files are sorted by time. Fixed Issues with loading big GIFs. Fixed Security and Optimization for Simplified and improved the design of the virus scan result page. The below are the download links for Xiaomi Redmi 5A Stock ROM, which can be used to flash Mi 5A phone with EDL Mode. Fastboot or EDL Mode Redmi 5A firmware or ROM, as you know Redmi 5A also known as Mi 5A or Xiaomi 5A or Xiaomi Redmi Mi 5A or what ever it called.